This week was . . . . not exactly what I had planned out. But that's okay! It was a step-back week and I didn't miss any super important workouts (like my long run) so it didn't bother me. My older daughter was home with me all week so where I might have normally snuck workouts in, I didn't have the free time this week. I did, however, drag her on a hike and to a yoga class! This week helped me remember that even though I have big goals for myself, I can also be flexible with my training. One thing that I feel like is supporting my training is my daily walks to the girls' school. Twice a day I walk to school, which includes some stairs climbing (taking them two at a time is good for the bum!). So in any given week I am walking about eight miles on top of anything I include in my training log. The other thing is that this week I literally spent over 75% of time in either workout clothes or "pajamas" (aka not technically pajamas, but just the clothes I sleep in). Yeah, it's a problem. They are so comfy though!!!! Did two loops of the Discovery Park Loop Trail. 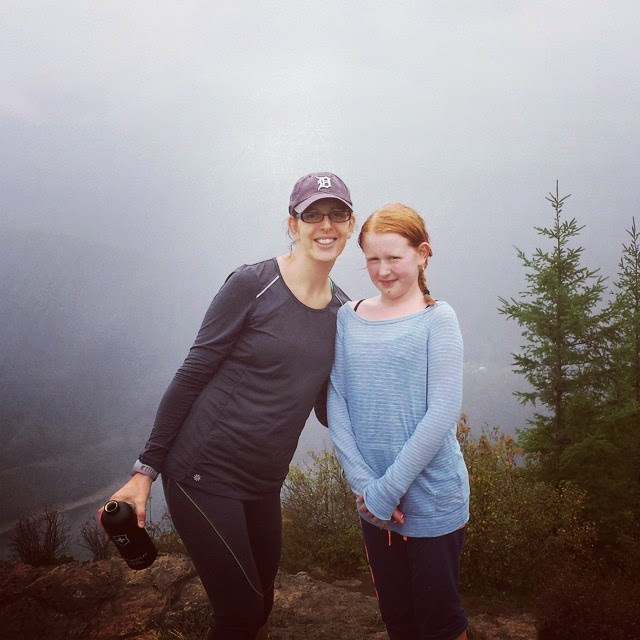 My daughter, my friend and I hiked up to the top of Rattlesnake Ridge! Two miles up, two miles down. It was a great hike (other than the 10 year old who was less than enthusiastic). Unfortunately the view from the top wasn't as spectacular as it was two years ago when I did the same hike-- it was drizzly and windy and cloudy this time. Oh, well! On the hike I was thinking about the Rattlesnake Ridge Trail Run, the 50K goes right up that section of trail! The half marathon goes down it. Hmmm, maybe the half marathon is a better idea. Iris and I at the top of Rattlesnake Ridge. When the instructor asked the class what we would like to work on, I immediately said "hips!" and oh, did she deliver. So good, and sooooo hard. Yoga is HARD (and necessary!) for runners. Or, well, at least this runner!